Deepen your sense of the past at sights like Historic Village Herberton and St Monica's Cathedral. Get in touch with nature at Fishing Charters & Tours and Kayaking & Canoeing. Explore Cairns' surroundings by going to Yungaburra (Cathedral Fig Tree & Curtain Fig National Park), Walu Wugirriga Lookout (in Cow Bay) and Babinda Boulders (in Babinda). Spend the 18th (Thu) exploring nature at Lake Eacham Crater Lakes National Park. There's still lots to do: take a tour by water with Boat Tours & Water Sports, delve into the lush surroundings at Daintree Rainforest - Cooper Creek Wilderness, step off the mainland to explore Michaelmas Cay, and take in the dramatic scenery at Josephine Falls. To find where to stay, ratings, more things to do, and other tourist information, refer to the Cairns planner . Dubai, United Arab Emirates to Cairns is an approximately 17.5-hour flight. You can also do a combination of shuttle and flight. The time zone difference moving from Gulf Standard Time to Australian Eastern Standard Time (Queensland) is 6 hours. Prepare for much colder weather when traveling from Dubai in July: high temperatures in Cairns hover around 30°C and lows are around 20°C. Finish your sightseeing early on the 20th (Sat) so you can travel to Kings Canyon. Kick off your visit on the 21st (Sun): stroll through Lake Cathie Foreshore Reserve, tee off at Port Macquarie Golf Cub, and then tee off at Port Macquarie Driving Range and Mini Golf. Keep things going the next day: soothe aching muscles at some of the top local wellness centers and then take in the architecture and atmosphere at St Thomas Anglican Church. To see photos, more things to do, ratings, and tourist information, go to the Port Macquarie trip planner. You can fly from Cairns to Port Macquarie in 7 hours. Other options are to do a combination of flight and bus; or drive. Expect much colder weather when traveling from Cairns in July: highs in Port Macquarie hover around 13°C, while lows dip to 9°C. Wrap up your sightseeing by early afternoon on the 22nd (Mon) to allow time for travel to Kings Canyon. Start off your visit on the 23rd (Tue): identify plant and animal life at Watarrka National Park. 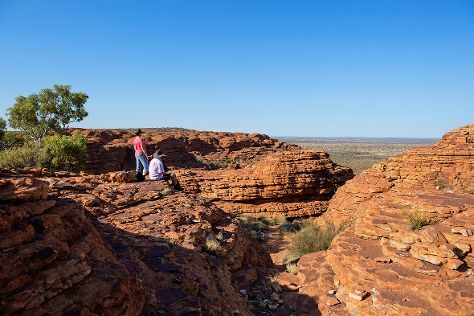 Get ready for a full day of sightseeing on the next day: take in breathtaking views at Kings Canyon Walk, then take an unforgettable tour with a helicopter tour, and then contemplate in the serene atmosphere at Kings Creek Station. To see other places to visit, traveler tips, ratings, and other tourist information, read Kings Canyon vacation planner . You can drive from Port Macquarie to Kings Canyon in 32.5 hours. Wrap up your sightseeing on the 24th (Wed) early enough to travel to Nullarbor. On the 25th (Thu), explore the wealth of natural beauty at Nullarbor National Park. On the 26th (Fri), you'll have a packed day of sightseeing: don't miss a visit to Great Australian Bight. For maps, photos, ratings, and other tourist information, you can read our Nullarbor day trip planner . You can drive from Kings Canyon to Nullarbor in 24.5 hours. Cap off your sightseeing on the 26th (Fri) early enough to travel back home.